EMCO is the cream of the crop when it comes to Ping Monitoring solutions. Ranging from the Free Version to the Enterprise Edition, this utility can perform ping monitoring of just a few hosts to thousands of hosts. EMCO is trusted by brands like Prada, Verizon, Starbucks, and CitiBank – to name a few. It uses Ping to detect connection outages and monitors hosts in real-time by dedicated working threads so you can get real-time statistics and notifications. Multi-Host Ping Monitoring – Beginning with 5 hosts on the Free Edition to thousands on the Enterprise Edition, there is not limitation to the number of monitored hosts. 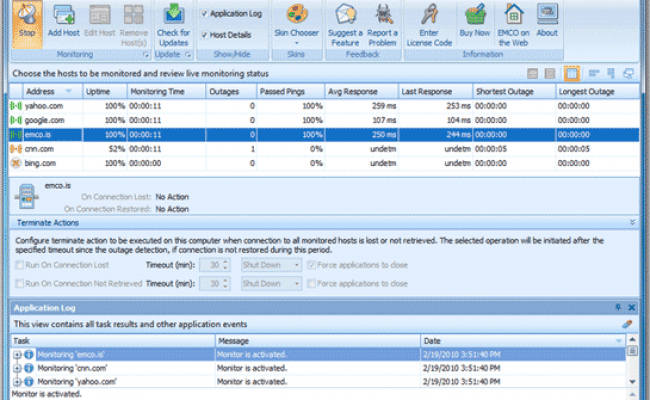 EMCO Ping can monitor multiple hosts simultaneously. When the utility pings a monitored host, is can give you information about the ping response time, response deviation, and allows you to estimate the quality of the network connection. All of the statistical information gathers regarding the pings can be represented visually by a variety of charts. The application can automatically generate reports in different formats representing the host statistics you want to see. Detects and alerts you if there are connection outages. Fully Customizable and integrate-able with external software for executing scripts or executable files when connection are lost. 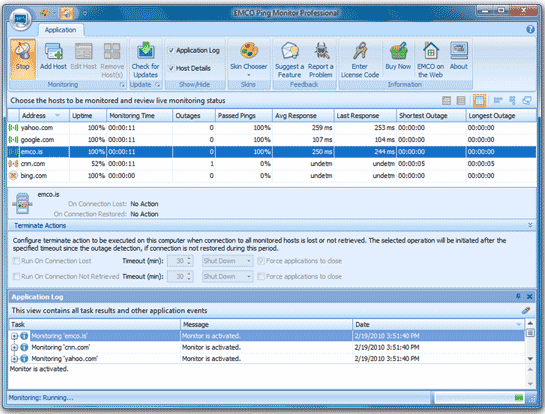 Free Edition – Allows you to monitor up to 5 hosts but does not allow any specific configuration. It runs as a Windows service, so monitoring stops when you log out of Windows. The Free Edition does not cost anything. Professional Edition – Can monitor up to 250 hosts and every host can have a customer configuration and it runs as a Windows service so monitoring will continue even if you log off. 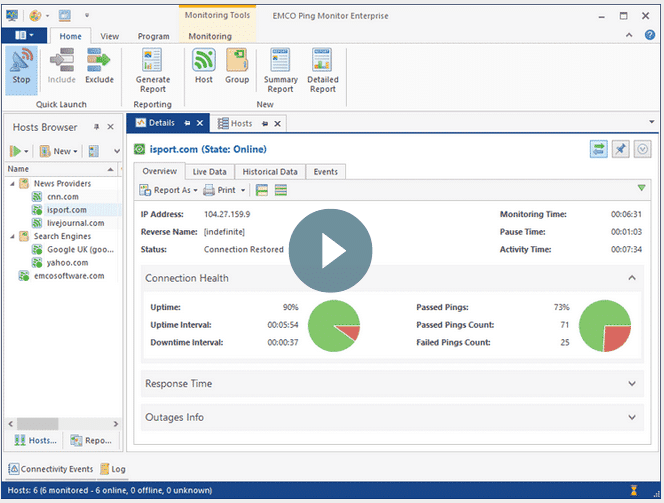 Enterprise Edition – There is no limit to the number of monitored hosts. The Enterprise Edition includes all of the available features and works in a client/server setup.